Out went the New Year's Resolutions from previous years, that always left me feeling guilty if I didn't manage to complete them, and instead, I embraced 2016 with a new outlook, a new idea for making the most of a brand new year. This time last year, 366 days ago, I shared 5 Things to Try in 2016. I wanted to move away from the stereotypical New Year's Resolutions and instead focus on what really mattered for me in 2016. Becoming a Mother, our family dynamic changing, having 10 months of maternity leave and then of course, returning back to work. 2016 was a big year for me and I didn't need a list of resolutions pestering me to complete them, I needed a relaxed approach and it worked, oh boy did it work. I went with the flow, I let things happen. I didn't overly plan, I didn't worry if a few tasks here and there were forgotten about, I had new priorities after all, and what beautiful priroties they were, my little girl. Instead of ending 2016 feeling guilty for failing and not meeting the unnecessary expectations I set myself, I finished 2016 feeling like I'd had a pretty good year. In 2017 I want to take a similar approach and so instead of a list of resolutions for the year ahead, I have decided to work on one thing each month, in the hopes of finding myself in a more positive, happier place at the end of 2017. Each month I will be sharing The Month of Project; 12 months of tackling a specific goal, topic or ambition. This isn't going to be a strict project, in fact, I'm not giving myself any sort of expectations with this project, instead simply giving myself a couple of little goals to help me along and keep me on track over the next 12 months. This includes keeping a mini-journal, documenting each month and how I am getting on, using specific hashtags each month across my social media channels to share how I am getting along with each month's project and reminding myself to approach the project with a light-hearted mindset. After all, I don't want the project to be like New Year's Resolutions and kick myself if I do something wrong; think of it as a project of personal growth, expect ups as well as downs and overall, just be dedicated to each month's theme. 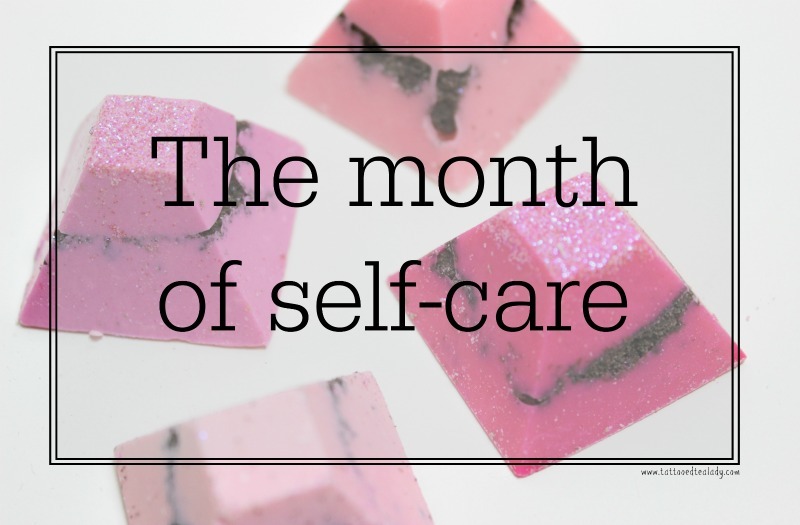 For January I decided to kick things off with A Month of Self-Care. A little self-indulgent? Maybe, but 2016 had a few negatives for me where my mental health and self-image are concerned, and so now that the hectic festive season is behind us, I wanted to take this month to relax, unwind and spend a bit of time giving both my body and mind some much needed TLC. Each day I want to do something which will help me feel better, mentally and emotionally, something which will leave me feeling relaxed and calm, something which will benefit me personally. It could be something as simple as reading a book, taking the time for a hot bubble bath or staying away from technology for the day. Sometimes it'll be a quick and easy task which adds a touch of positivity to my day, other times it'll be something I've really worked hard at, taking a little bit longer but leaving me feeling accomplished and capable of doing better - or so I hope! Want to get involved? Make sure you're following me on Instagram @TattooedTealady, Twitter @TattooedTealady and Facebook 'Tattooed Tealady', where each day I will share what I have done for The Month of Project. For January I'll be using the hashtags '#TTLMonthOf ' and '#TTLMonthofSelfCare'. If you're joining in and making January a Month of Self-Care too, then make sure you share your day's self-care task with me, feel free to use the hashtags too, let me know how you're getting along and what you want to gain from your Month of Self-Care. 2017, I know you'll be wonderful. There will be ups, there will be downs, but you are a year that follows on from the best year of my life. There really only is 'up!' from here, and I'm so excited to see where this year takes us. I love the idea of a new challenge each month! Best of luck with your self care month ♥ and happy new year! Breaking it down into monthly goals is also a game-changer for me :) it shifts your perspective so much! Good idea to break it down into months. All the best. What a lovely idea. And definitely self care is so important so why not start on it first! !